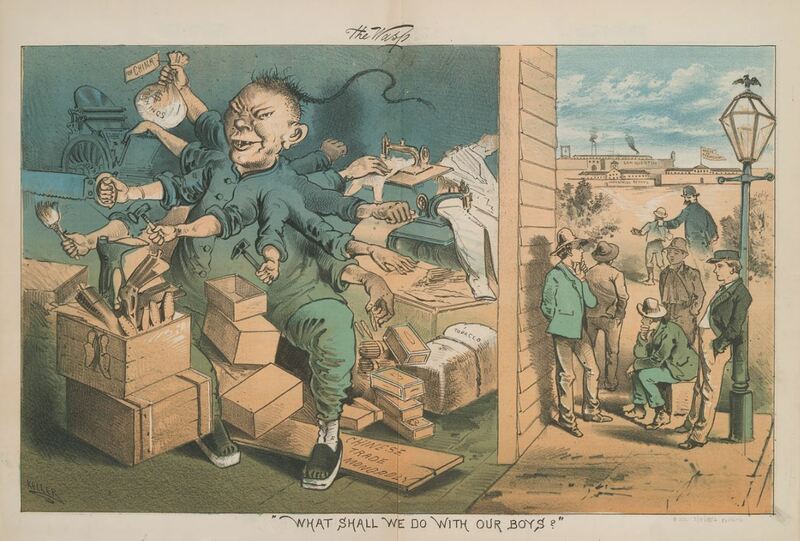 This commanding cartoon was published by The San Francisco Wasp approximately one year before the Chinese Exclusion Act was enacted on May 6, 1882. 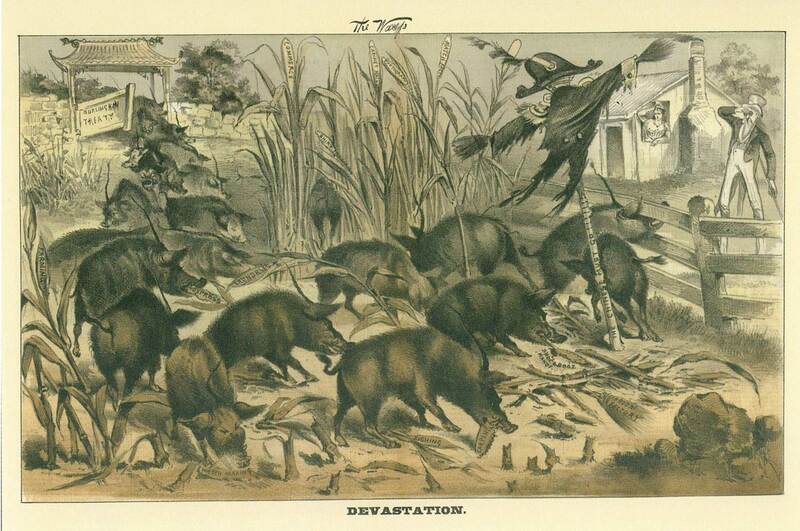 The image appealed to white workingmen’s fears of a Chinese takeover of American society and enterprise. Despite the Chinese only occupying 0.002 percent of the population, visual depictions of the Chinese continued to reinforce imagery of infestation and sinister monopolization of industry. The Coming Man colorfully illustrates the worst in negative stereotyping and Sinophobia. The Chinese man’s over-sized left hand stretches out to the foreground of the image. It is stamped “MONOPOLY” and his fingernails are represented as animal talons, the nails are curled and grow upward like an overhang of a pagoda. 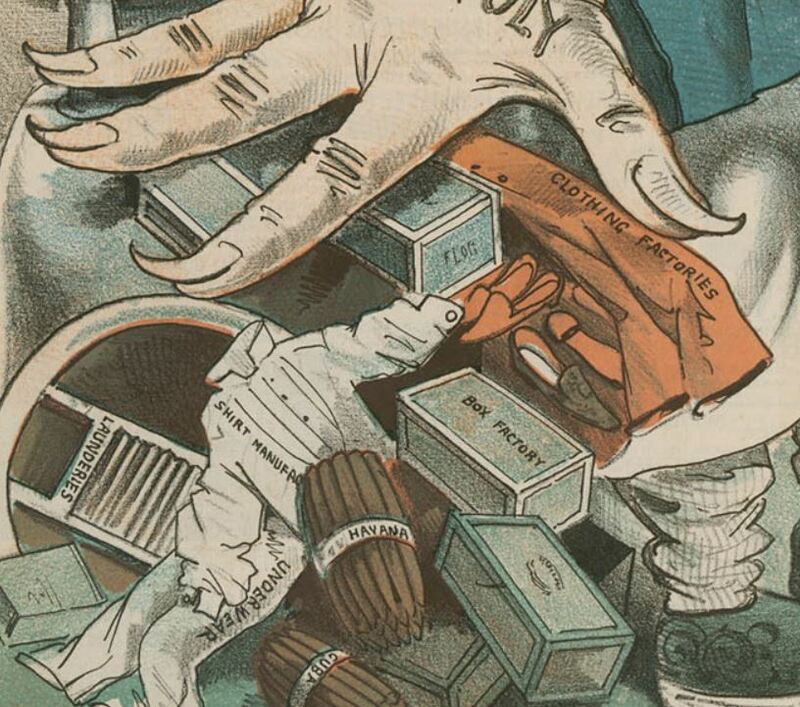 The hand grasps control over trades and services for which the Chinese were most associated – cigar making and sales, laundry, underwear and shirt manufacturing, box factories, clothing, and shoes. Above his blue mandarin jacket (Chinese tunics were commonly blue, purple or black) is the image of a Chinese nightmare for white Americans. The Chinese man’s face is grotesquely distorted and he greets the viewer head-on with a sinister expression. As if to focus better on those looking upon him, he closes one eye with his index finger to sharpen his stare. His right eye and brow lurch up at an unnatural angle. His ears and nose are large. A devious smile reveals a single tooth, evidence of his bad health. His tongue dangles from the left side of his mouth. On his shaven head is a skull cap. From the back of his head, the Chinese queue appears to have a life of its own, and whips out from behind the head. The very end of the hair queue looks like the end of a whip. This Chinese man is not afraid of the white workingman clientele and readers of The Wasp. 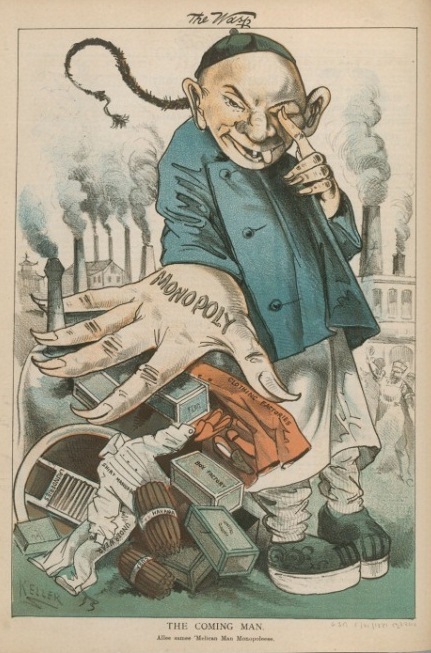 Behind him and to the left, six factories smolder with industry, possibly a reference to the Chinese Six Companies, an organization which advocated for the Chinese in America. A Chinese pagoda is seen among the buildings. On the right, a few angry, white, Euro-centric workers appear, faintly drawn. They are disappearing. A bearded man wears an apron and a white hat and holds his fist up in the air. Only two factories are viable on this side of the image. The dominant colors of the cartoon are red, white and blue. This Chinese Man, this “coming man” has taken over the American Dream. He has pushed American workers into the background. The implicit message of the cartoon is to stoke fear and uncertainty. This man and others like him must be stopped from coming. 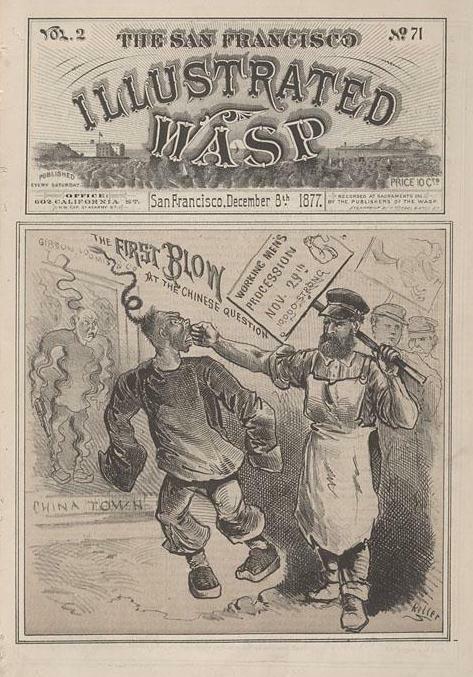 Readers of the San Francisco satire magazine The San Francisco Illustrated Wasp did not receive a balanced view of the Chinese in their cartoons or accompanying articles. The readership of the magazine lived with and believed in the terror of white unemployment caused by cheap Chinese labor. They expected and received a press that was sympathetic to their concerns. “No variety of anti-European sentiment has ever approached the violent extremes to which anti-Chinese agitation went in the 1870’s and 1880’s. 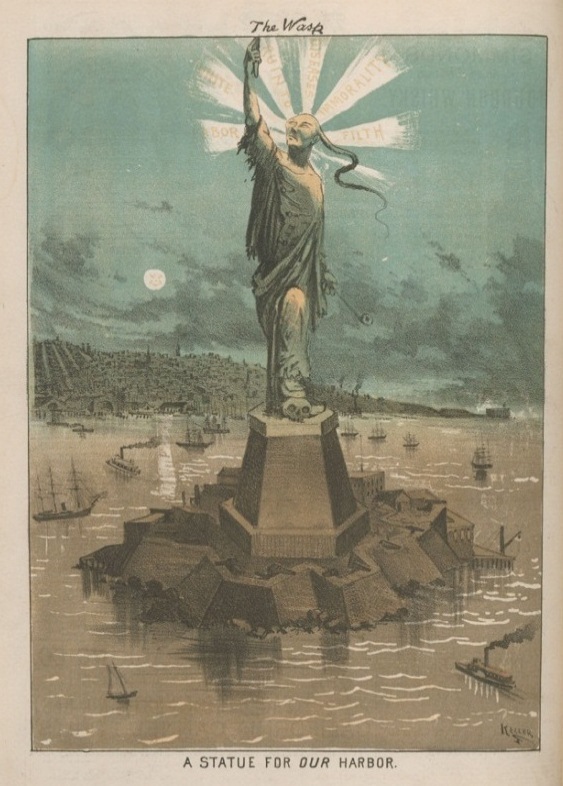 Despite laws and treaties promising federal protection, “lynchings, boycotts and mass expulsions still harassed the Chinese after the federal government yielded to the clamor for their exclusion in 1882” (Higham 25). 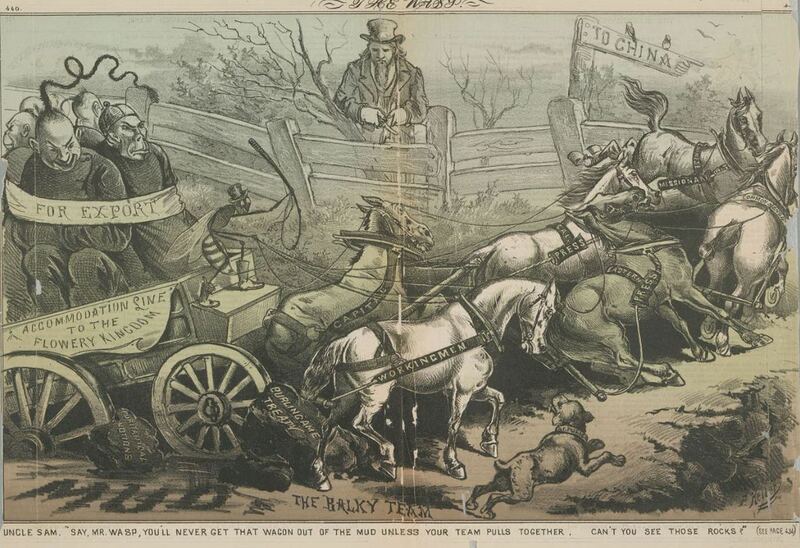 Steadily, the Democratic Party, fueled by an infusion of “southern exports” and white “Workingmen’s Party” members merged into a powerful force to treat the Chinese and other minorities in the West with “similar brutality in legislation, in land policy, and in labor practices” (Pfaelzer 58-60). It was easier to justify the violence, the driving out, the boycotts and mistreatment of the Chinese when they could be turned into something less than human. 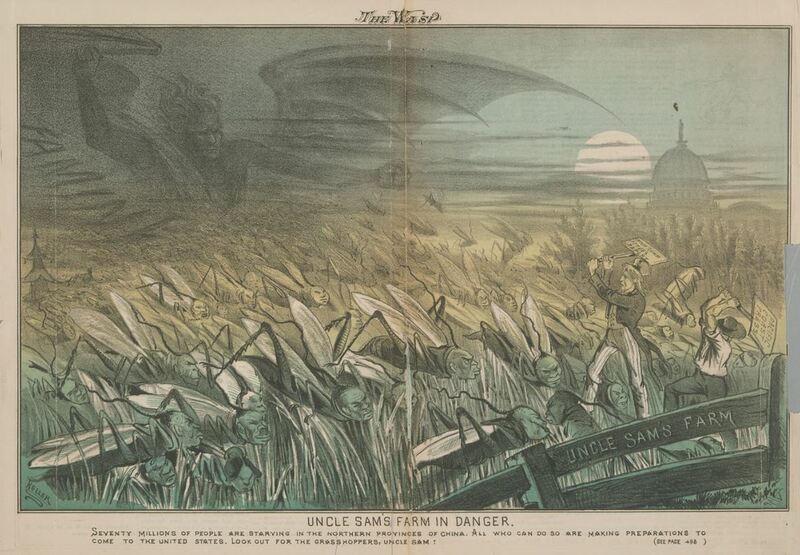 The labor issue, one of the six categories Richard S. West showcases in his book, was the focus of The Wasp’s first anti-Chinese, pro-white labor cover, The First Blow at the Chinese Question. West prefaces the image by acknowledging that 15,000 men out of work in San Francisco alone, added to the white labor agitation. 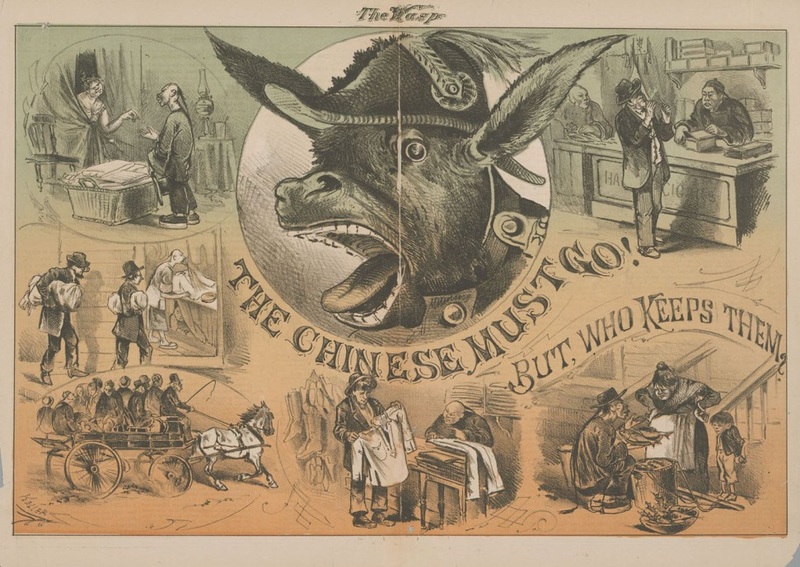 The Chinese immigrant was made to be the scapegoat (West 156). A sturdy-looking white man wearing a trade apron, and two other laborers behind him have entered Chinatown. They encounter a Chinse man on the sidewalk. In one hand, the lead worker carries a sign, “Working Men’s Procession.” With his right arm, the lead workingman lands a punch directly into the face of the Chinese immigrant. The blow knocks his victim off balance. The Chinese man’s long queue spirals outward from the impact. His oversized tunic extends past his arms, covering his hands. The Chinese man does not curl his fists in to strike back. Keller has neutralized this victim. Another Chinese immigrant stands behind a storefront door or window and reacts in horror. He is distorted and ethereal. His whole body is aquiver, as if he is being vaporized, like a genie returning to a lamp. His fluid contours suggest he is fading away. This second Chinese figure is startled and his queue reacts in the same manner as the man under attack. He holds a gun by his side, but he makes no attempt to raise the weapon in defense. He is unable to protect his territory, his placement inside the rectangular border limits his power. The frame suggests he is reduced to one dimension, a poster or piece of wall art. As Lenore Metrick-Chen suggests, it was fashionable for Americans to collect Chinese art, but acceptable to exclude the Chinese people. The Wasp suggests that the Chinese belong on walls, but not in the streets. 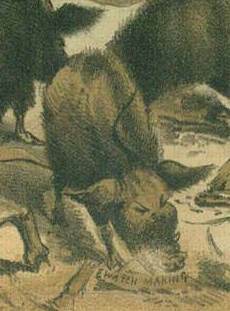 Unlike Nast’s portrayals of the Workingmen’s Party, Keller’s representation of Causacian labor are generic and do not possess brutish features. Their behavior says otherwise.